A wonderful "old world" bread, rich enough to serve as dessert. To serve as dessert, spoon Cream Cheese Topping over slices of warm or cold bread. In large mixer bowl, combine 1cup flour, yeast, 2 TBSP sugar and salt; mix well. Add water (120-130°F), butter and egg yolks. Blend at low speed until moistened; beat 3 minutes at medium speed. By hand, stir in rind, raisins and almonds. In small mixer bowl, beat egg whites until stiff; gradually add ¼ cup sugar. Fold into flour mixture. Gradually stir in enough remaining flour to make a soft dough. Knead on floured surface until smooth and elastic, 3 to 5 minutes. Place dough in lightly oiled bowl and turn to grease top. Cover; let rise until dough tests ripe. Punch down dough. On lightly floured surface, roll or pat to a 14x7-inch rectangle. Starting with shorter side, roll up tightly, pressing dough into roll with each turn. Pinch edge and ends to seal. Place in greased 9x5-inch bread pan. With very sharp knife, make a lengthwise slash, ¼ inch deep, down center of loaf. Cover; let rise in warm place until indentation remains after lightly touching. Bake at 350°F for 35 to 40 minutes until golden brown. Remove from pan. Serve warm or cold. Thanks this sounds so good you will be on my Easter table. Thanks for sharing the many interesting recipes that show up via email every now and then. Have tried several, always pleased with the finished baked goods. looking forward to trying the recipe for Finnish Easter bread this week. 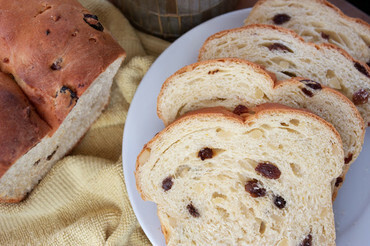 this loaf together with a batch of Hot Cross Buns is bound to make the grandkids happy.